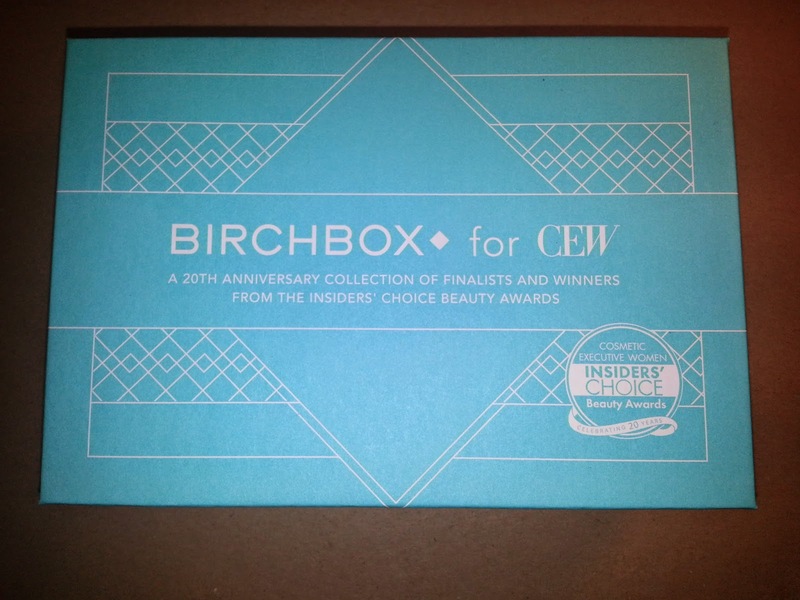 Last week, Birchbox released two limited edition boxes based on the 20th anniversary of the Insiders' Choice Awards. 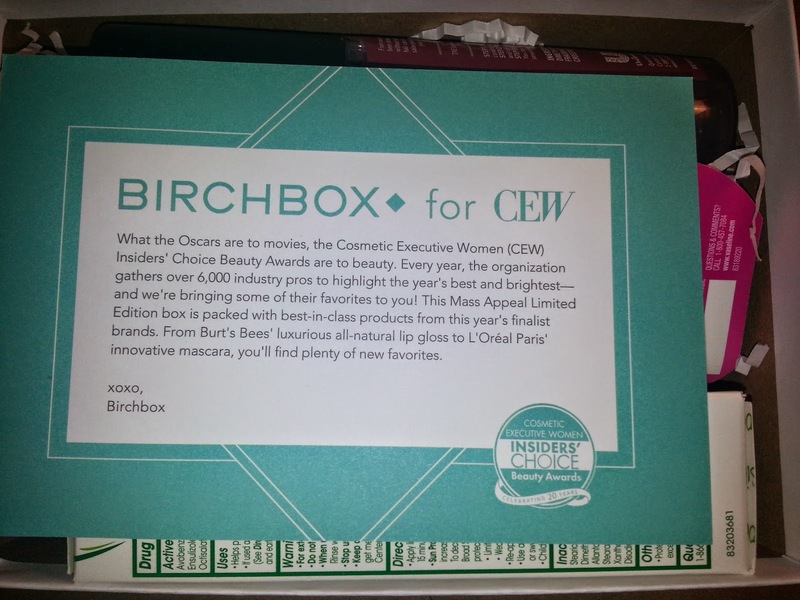 These two boxes teamed up Birchbox with the Cosmetic Executive Women (CEW) which highlights the best products available currently available. 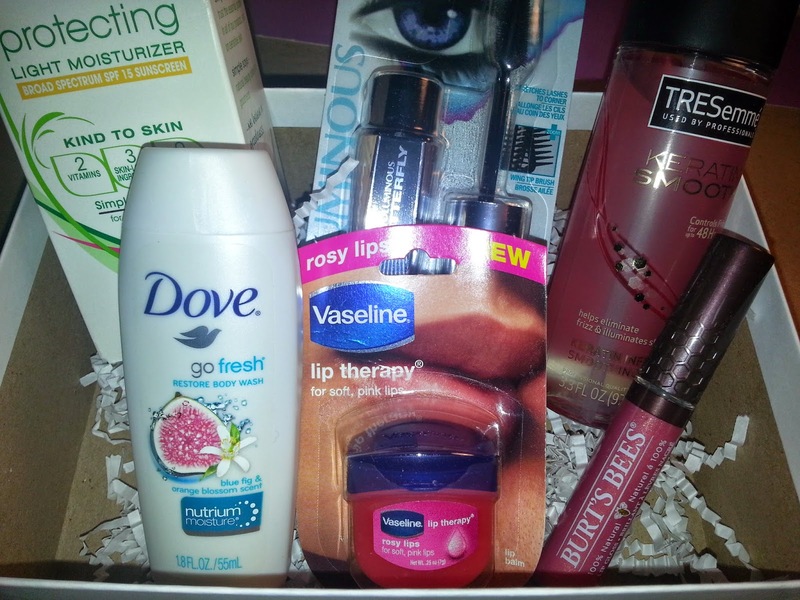 They did two boxes, this one with Mass Appeal (drugstore) and another one with Prestige Headliner items. They did a great deal where the Prestige box was $18.00 and the Mass Appeal was $15.00, but you saved $5.00 if you purchased both together. This was a great deal and a great way to try out new brands, both prestige and drug store, so I just had to get both. Here's the box! Like the Prestige box, this box is adorable! I love the shade of blue and I think I would own everything I could ever get in this shade. Info card. It does a great job explaining what CEW is and how items were picked. First look. Everything was packed in there tight! TRESemme Keratin Smooth Keratin Infusing Serum ($5.99) - Full Size! I am a Tresemme addict, so I was so happy this was included. I switch out using their Keratin line and another brand of products, so this will definitely be used up. This is a serum that is supposed to smooth out frizz, which I definitely have, and make your hair shiny! I recommend all Tresemme products. L'Oreal Paris Voluminous Butterfly Mascara ($8.49) - More mascara and more full size! While I love getting mascara, I'm not a fan of mascara that isn't waterproof. This will more than likely be put into a giveaway box, but that's not to say this isn't a great product. 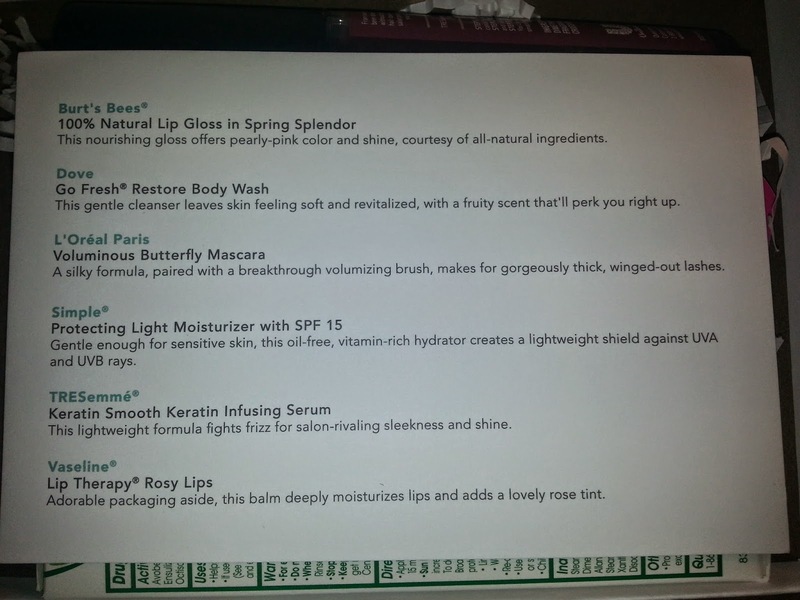 Burt's Bees 100% Natural Lip Gloss (Spring Splendor) ($8.99) - Another full size! Geez, they are loading this box down. I have used BB before, but never their lip glosses. This has a great color without being too dark. There are other shades that I will add to my list of what I need to buy next, also. Simple Protecting Light Moisturizer SPF 15 ($12.99) - I have been wanting to try Simple products, so this was great placement for me. I can always use another moisturizer with SPF because I absolutely hate using sunscreen! 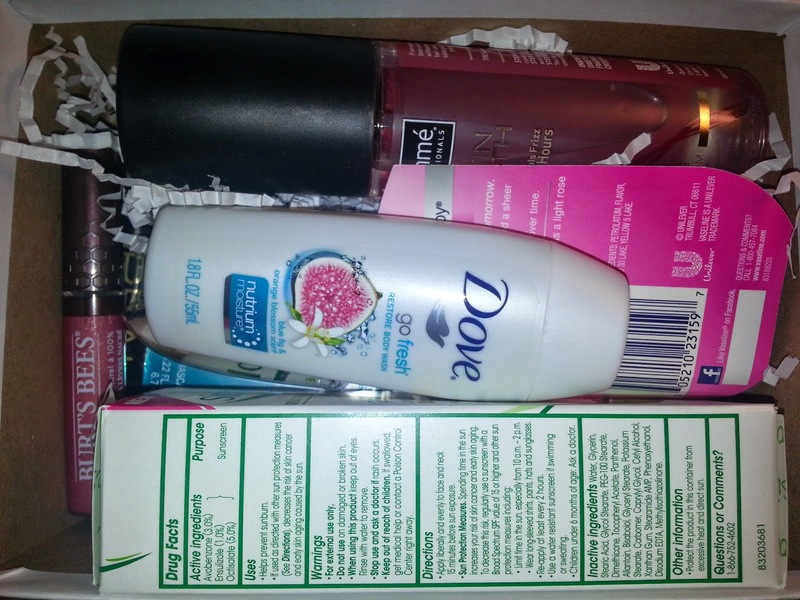 Dove Go Fresh Restore Body Wash (Blue Fig) - ($0.74) - I like Dove's body wash and use it regularly, so this will go into my pile of samples to use for travel. It has a great scent and it's very moisturizing. 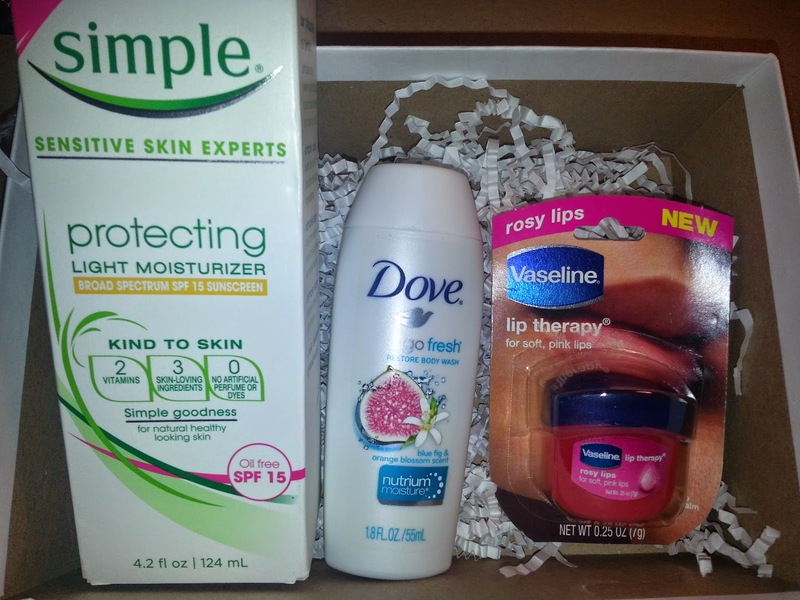 Vaseline Lip Therapy (Rosy Lips) ($2.27) - This is completely new to me. I know people use traditional Vaseline on their lips overnight, so I like that this comes in a color so I can use it daily! The value of this box is $39.47, which is a great deal for what I paid! It's great regardless because I can find a use for most of the products. Did anyone else try out the CEW boxes and find something amazing? Let me know in the comments!